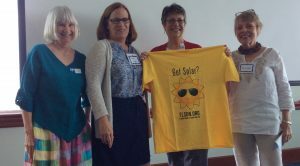 Volusia County Solar Co-op members show support for solar. The 58-member Volusia County Solar Co-op today issued a request for proposals (RFP) from area solar installers. The group members created the co-op to save money and make going solar easier, while building a network of solar supporters. The group also announced it will host its next information meeting on October 5, at 5:30 p.m. at the Deltona Regional Library Auditorium (2150 Eustace Avenue) to educate the community about solar and the co-op process. Click here to RSVP. Installers interested in bidding can download the RFP here and the response template here. Volusia County residents interested in joining the co-op can sign up at the co-op web page. Joining the co-op is not a commitment to purchase panels. Co-op members will select a single company to complete all of the installations. They will then have the option to purchase panels individually based on the installer’s group rate.